After a breast reconstruction patient shared Amanda’s* story with Dr. Neil Zemmel, he knew he had to help this woman. Amanda had been brutally beaten, sexually assaulted and for years had been living with the physical and emotional scars of this abuse. The attack was so brutal it ruptured her breast implant. For years she has suffered with physical and emotional pain. She hangs a towel over her bathroom mirror when she showers, blocking her reflection and the painful reminder. 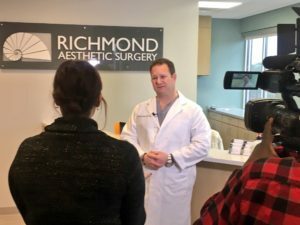 Dr. Zemmel wants to help Amanda recover and is performing a breast revision on her – a surgery that is not covered by insurance and would be out of her reach without Richmond Aesthetic Surgery’s help. Dr. Zemmel’s team is looking forward to helping Amanda with her journey to recovery. Amanda’s story was recently featured on WWBT/NBC 12 Richmond. In the segment, she told her incredible story and explained the aftermath of the violent incident that has caused her to live with physical and emotional pain for years. During the feature, Dr. Zemmel recounted his reaction to hearing about Amanda and explained what her procedure will entail to achieve the best possible aesthetic outcome. Watch the NBC 12 domestic violence segment featuring Amanda’s story. *Name of patient has been changed to protect her identity.